Martha Castro captured the story of Ben Matsui, a Purple Heart recipient, for her winning Go For Broke National Education Center essay. When Go For Broke National Education Center put out a call for young people to submit essays about Nisei soldiers for a chance to meet their distinguished elders at their Evening of Aloha gala dinner, it wasn’t clear how young people would respond. At a time when the story of the men of the 442nd Regimental Combat Team, 100th Infantry Battalion, and Military Intelligence Service seemed far removed from the everyday lives of high school and college students not even born until 55 years later, it was a challenge to find young people willing to gather and compose their thoughts to tell stories many of them previously knew little about. In the end, many students came forward to submit essays, but three of them made a particular impression on the five judges — all retired schoolteachers. Mary Jane Fujimura, a former elementary teacher, said they unanimously agreed that the criteria of “coming from the heart” helped determine the three students to be spotlighted in the Evening of Aloha dinner program. Their intelligence and passion were combined to create beautiful tributes to the former fighting men. Castro found her informative subject with the help of her Aunt Fusae (Yoshida), who played bridge with Matsui’s wife. Coincidentally, she later learned that Matsui was also a member of the Buddhist church Castro attended in Oakland. The high school freshman already knew about the incarceration through her grandparents, Sho and Ruby Yoshida, but knew nothing about the men who left camp to join the Army. Through the writing process, she concluded the following about Matsui and others like him: “You can imagine the irony of the situation — being imprisoned because of his race and then asked to fight for the country that imprisoned him.” She also expressed Matsui’s overriding message: to prove loyalty at the risk of dying. The other 14-year-old essayist, a tenth-grade JROTC cadet from Honolulu, was far more intimately aware of the story of the Nisei soldiers. Since age 9, Andre Kai Wang volunteered with the Hawaii Historic Arms Association as a Living History Day re-enactor of the Nisei soldier. He described his role of dressing in an exact replica of the soldier’s uniform during ceremonies with the goal of educating the public. A 17-year-old student at Kamehameha High School, Sean Segundo is the senior writer featured in the dinner program. 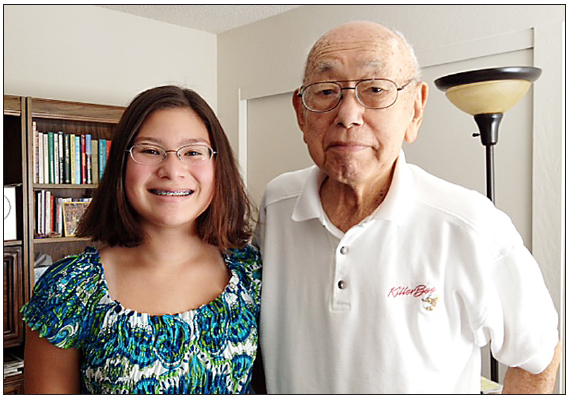 He learned about the Nisei after watching a documentary on them at school, but he was already well versed in the contributions of the military since his grandfather, father and two uncles were all veterans. What stood out about Sean’s essay was his ability to apply the lessons learned during World War II to the present day, citing such leaders as Martin Luther King, Jr. and Harvey Milk, who fought discrimination in much the same way the Nisei soldiers did. 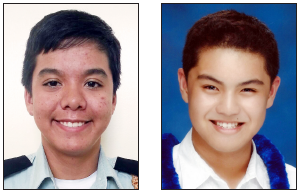 These young writers will travel from their hometowns to attend the Evening of Aloha Gala dinner on Oct. 12, at the Westin Bonaventure Hotel & Suites as special guests of Go For Broke National Education Center. They are among many young people who won the opportunity to attend by making the effort to submit essays for the rare chance to meet the veterans and their wives in person. As these thoughtful teens meet the men about whom they so insightfully wrote, they provide that essential link between past and future generations — ensuring that the contributions of the Nisei generation are never forgotten. All of the essays will be printed in a special booklet available at Evening of Aloha and subsequently online at www.goforbroke.org.